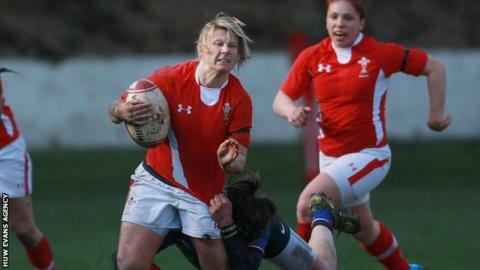 Head coach Rhys Edwards has named six uncapped players in the Wales squad ahead of the Women's 2014 Six Nations championship. The squad includes Jade Newman (Blues), teenagers Hannah Jones (Ospreys), Eli Norkett (Ospreys) and Robyn Wilkins (Blues), and wings Ffion Bowen (Ospreys) and Laurie Harries (Blues). Scarlets full back Mared Evans returns to the squad after injury. "We've chosen the squad on form at both club and regional level," said Edwards. "It might be considered that we are gambling with two or three of them but all those who have been selected are picked on merit because of their form, attitude and commitment." Jones and Norkett are just 17-years-old while Wilkins is only a year older, but Edwards says they deserve their selection. "It's all about giving some of the promising players experience at the top level," insisted Edwards. "As an example Robyn is the most promising player in her age group and she can play at either 10 or 12 so that gives us extra options. "We want to put her in a big game environment during the Six Nations as we also look ahead to the World Cup as well." Edwards claims the recently completed Women's Regional Championship has played a part in the selection of his Wales squad. "We didn't even know Ffion Bowen three weeks ago but she has proved in a relatively short space of time she can finish - and finish well on the wing," said Edwards. "She is a young and exciting prospect and a player we hope to nurture through the Six Nations." Wales finished fourth in the 2013 Six Nations, winning two games, while Ireland completed a first Six Nations Grand Slam. Backs: Sian Moore (Bristol Ladies/Ospreys), Amy Day (Llandaff North/Dragons), Laura Prosser (Pontyclun/Blues), Elinor Snowsill (Bristol Ladies/Dragons), Hannah Jones (Neath Athletic/Ospreys), Robyn Wilkins (Llandaff North/Blues), Rebecca de Fillippo (Bristol Ladies/Dragons), Elen Evans (Waterloo/Scarlets), Philippa Tuttiett (Llandaff North/Blues), Elli Norkett (Neath Athletic/Ospreys), Ffion Bowen (Maesteg Celtic/Ospreys), Laurie Harries (Llandaff North/Blues), Dyddgu Hywel (Bristol Ladies/Scarlets), Mared Evans (Llandaff North/Scarlets).